There isn’t anything better than spending time with your dad, especially if that time is spent fishing. I was lucky enough to spend much of my childhood doing just that. 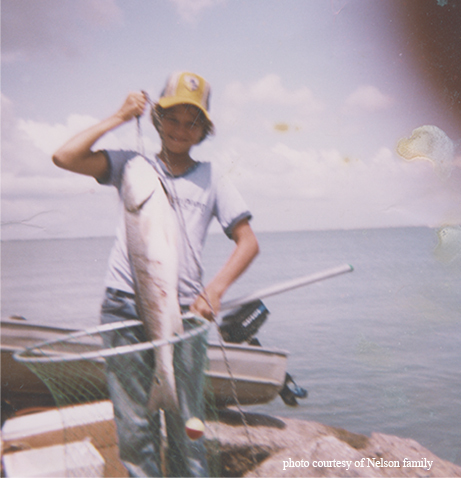 Whether we were walking Galveston Bay’s North Jetty, wading the Bolivar Pocket, exploring Fort Travis or trying to catch a striped bass at the dam at Sam Rayburn, Dad and I were always sharing an adventure. Midway through summer when I was 11, Dad decided we’d go for a weekend camp at the North Jetty. Friday night, lawn chairs were added to the provisions we loaded into the Stella, our 12-foot johnboat. Every weekend we transported the trusty little vessel to the end of Bolivar Peninsula and back in the rear end of Dad’s Country Squire station wagon. Saturday morning the wind was low and the day was hot, the water clearing. Dad and I, my brother John and his friend Mike (both 16) executed our standard morning routine. We waded the Bolivar Pocket chunking MirrOlures, Johnson Sprites, plastic shrimp tails and split-tail beetles, time and time again. The Stella was tied to Dad’s waist as we made our way toward the jetty. The little craft served as a floating wheelbarrow, carrying an ice chest, tackle boxes, extra rods and occasionally me. When I was 5 and not tall enough to wade through all the cuts in the pocket, I’d hop in for a ride. On days when the flats didn’t produce, we’d load up in the little skiff and head deeper. The power behind the versatile craft morphed over the years. 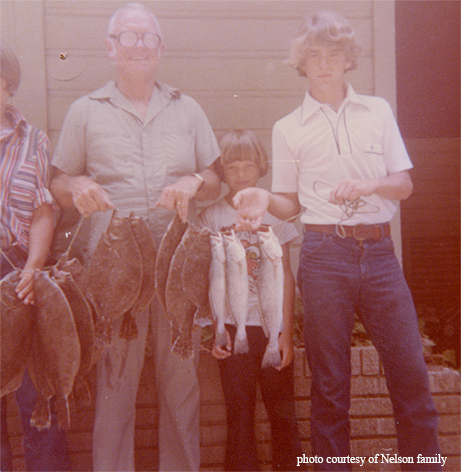 At first Dad rowed us to our destinations; next a Minn Kota trolling motor did the job. In later years, a 5-horsepower Mercury turned the Stella into a virtual speedboat. No matter the means of propulsion, my youthful imagination always turned the bow seat into a bucking bronco. I wrapped the anchor rope around my hand and rode every swell with one hand in the air and a rock in my motion. After a slower-than-expected day of fishing, the 16-year-olds in our party were ready to head back to Beaumont. Dad and I dropped the boys at the beach, loaded the collapsible chairs in our johnboat and headed for our campground for the night. We passed the cut and the first marker and picked a nice flat rock on which to land the boat. We gently nudged our way onto the boulders and unloaded our provisions before hauling the landing craft up two or three rocks to relative safety. The afternoon was still young, with plenty of daylight left to fish. We soon went to work, but the low tide produced slow fishing. The water was beautiful, clear and green, but the nonexistent current made the fish, save the mullet, inactive. Heat and boredom drove the 11-year-old me to alternative methods. I tied on the biggest Silver Johnson Sprite I could, selecting the spoon for the size of treble hook over any other qualities. A semi-flat rocky perch, partially submerged at water’s edge on the channel side, provided my attack point. I cast my spoon to a stationary school of mullet swimming aimlessly near the huge rocks. My retrieve consisted of letting the spoon drop under the big-eyed baitfish and yanking it back through in hopes of foul-hooking one. If you snagged a big one, it fought hard, and on a slow day you could cut it up for bait. 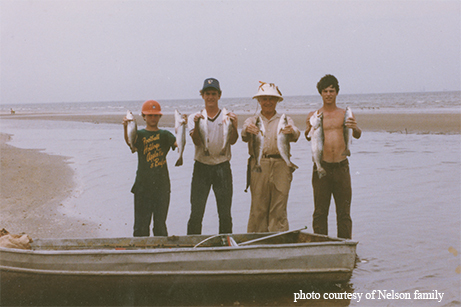 No telling what you might catch on fresh-cut mullet in the Gulf of Mexico. As my attempts to land a sharp point deep in the side of the hard-scaled flatheads failed time and again, I started to let the Sprite flutter just a bit farther beneath the surface with each cast. What happened next is etched into my memory as clearly as the brightness of the bluest Texas sky you have ever seen. As the spoon fell in crystal-clear water a mere 20 feet from me, I watched each sparkle of sunlight flash off its sides as it oscillated against the water’s resistance. From a crevice unseen in the submerged rocks, a beautiful 3-pound trout shot out vertically. She unhinged her jaws and enveloped the lure. Luckily, due to the trance I was in, my reaction was slow enough with the hook-set so as not to yank the treble hook out of the big girl’s mouth. Much yelling ensued. The first shouting came from me trying to garner Dad’s attention — no easy feat when he was 30 rocks away on the jetty. I was finally able to get him to see the bend in my rod. With admirable agility, the old Marine grabbed the net and bounded over and down to me. It was then that the sacred fish chant began. Suddenly the speck realized she was almost done for and turned to run for the hills. Now it was my turn to chant. Water splashed us both, the trout’s last little burst of drag run ended, and I turned her back toward the net. Finally he hoisted the prize out of the water. Invigorated by the afternoon’s surprise, Dad and I vigorously cast our lines toward the anchored ships in the Galveston Ship Channel for the next two hours. As I stared at the horizon, I happened upon the next element of our adventure. I noticed a strange wall of water headed our way. He gazed west for a few seconds. Dad grabbed me with one hand and the front hold on the Stella with his other. Thirty seconds after securing ourselves, a wave big enough to crash completely over the jetty at extremely low tide knocked us and the Stella three feet toward the Gulf side of the rocks. Just as suddenly, all was still. In our life jackets, with firm grips still on our little beached vessel, Dad and I did what we had done many times before and have done countless times since — we looked at each other with big eyes and laughed out loud. The rest of that night the tide rose. A yacht showed up just before dark and anchored on the Gulf side not far from us. Dad and I ate cold fried chicken while sitting in the lawn chairs and contemplated the yacht’s occupants. A little bass boat made multiple runs from the big boat to the channel side and back all night, so our imaginations turned the vessel into a drug boat. Those on board playing loud music were transformed into modern-day pirates. We talked of rewards, dangers and all kinds of wonderful stuff. The sky was completely clear, and every star was visible for miles. The wind didn’t even whisper, and the only sound was that of the waves. The thought of another rogue wave at high tide was evidently cause for concern for even the old Marine, so we didn’t sleep much. We fished and we talked as we dreamed, with nothing in our heads. What a night. When the sun rose, the water was as clear as it gets in that part of the Gulf — more blue than green, which just doesn’t happen often. The water teemed with Spanish mackerel, and we landed quite a few. We watched as schools of stingray glided gracefully by. In search of trout, we launched the Stella and headed back inland. Dad and I managed a couple of specks, and in the afternoon, we picked up a few more flounder. As the light softened, we made our way back across the flats and chunked a few last casts while wading into shore. We loaded the Stella into the car. Dad affixed the red handkerchief as a warning to vehicles that might not expect a boat to be sticking out of the back of a station wagon, and we headed to Beaumont as the sun slipped away. I’ve been lucky enough to catch sailfish in Mexico and chase smallmouth bass in Green Bay. I’ve been blessed to catch tuna in Cabo and hook a muskie in Wisconsin. I’ve caught trout all night under the lights at Rollover Pass and loaded a boat with salmon and rainbow trout on Lake Michigan. I’ve been granted a few kingfish and wahoo in North Carolina. I’ve fished lakes and ponds and caught big bass. 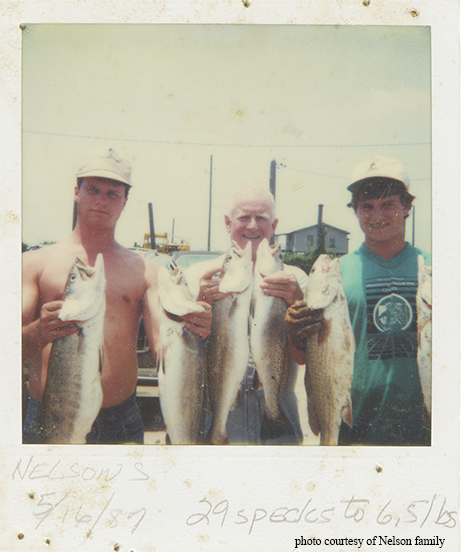 I’m proud of the 9¾-pound speckled trout on my wall. But I’d give it all back for one more perfect day like that one with my Daddy.